Buffalo Bill's most recent achievement may furnish a useful hint for Barnum. Colonel Cody and his savages are now at Rome, and the colonel—the intimate friend of the Prince of Wales, Americans will tell us—has manœuvred for a utilisation of the Pope in the way of puffery. A prayer was addressed to the Pope not long ago by Colonel Cody, alias Buffalo Bill, that his Holiness should grant to the said colonel and to his horde the authorisation requisite for persons who desire to "see the Pope." Leo XIII. 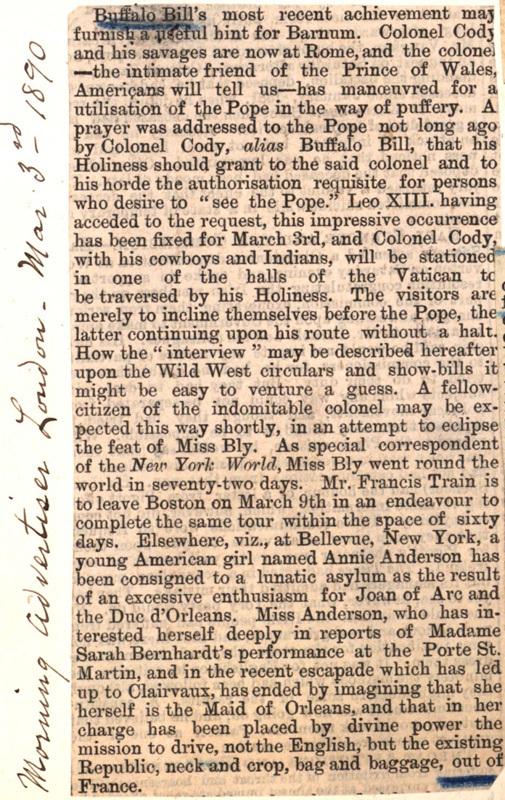 having acceded to the request, this impressive occurrence has been fixed for March 3rd, and Colonel Cody, with his cowboys and Indians, will be stationed in one of the halls of the Vatican to be traversed by his Holiness. The visitors are merely to incline themselves before the Pope, the latter continuing upon his route without a halt. How the "interview" may be described hereafter upon the Wild West circulars and show-bills it might be easy to venture a guess. A fellow-citizen of the indomitable colonel may be expected this way shortly, in an attempt to eclipse the feat of Miss Bly. As special correspondent of the New York World, Miss Bly went round the world in seventy-two days. 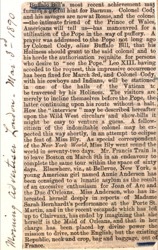 Mr. Francis Train is to leave Boston on March 9th in an endeavour to complete the same tour within the space of sixty days. Elsewhere, viz., at Bellevue, New York, a young American girl named Annie Anderson has been consigned to a lunatic asylum as the result of an excessive enthusiasm for Joan of Arc and the Duc d'Orleans. Miss Anderson, who has interested herself deeply in reports of Madame Sarah Bernhardt's performance at the Porte St. Martin, and in the recent escapade which has led up to Clairvaux, has ended by imagining that she herself is the Maid of Orleans, and that in her charge has been placed by divine power the mission to drive, not the English, but the existing Republic, neck and crop, bag and baggage, out of France.